This week at Kranky Geek in San Francisco, we are excited to introduce new AI-powered analytics that automatically analyzes your WebRTC metrics and identifies the root cause of trouble, eliminating costly manual data analysis and accelerating time-to-resolution. Available immediately for callstats.io enterprise and pro plus subscribers, these new capabilities are based on a state-of-the-art artificial intelligence architecture and form a cornerstone in the company’s mission to deliver analytics with answers. AI-powered analytics addresses three key pain points we have seen our customers face since we started in 2014: Building a monitoring system consumes specialized and costly manpower, problems are often unanticipated and undetected, and identifying the true root of the issue is complicated and time-consuming. Our proprietary artificial intelligence system looks to address all of these issues to save you time, manpower, and money. Identify external factors (ISP, network type, geographic location) and data sources for monitoring. With our artificial intelligence system, we take all of that off your plate. We efficiently monitor and analyze large volumes of WebRTC service data, saving man-hours of manual analysis. Our proprietary Objective Quality metric aggregates multiple data points to produce an accurate indicator of the quality of user experience. 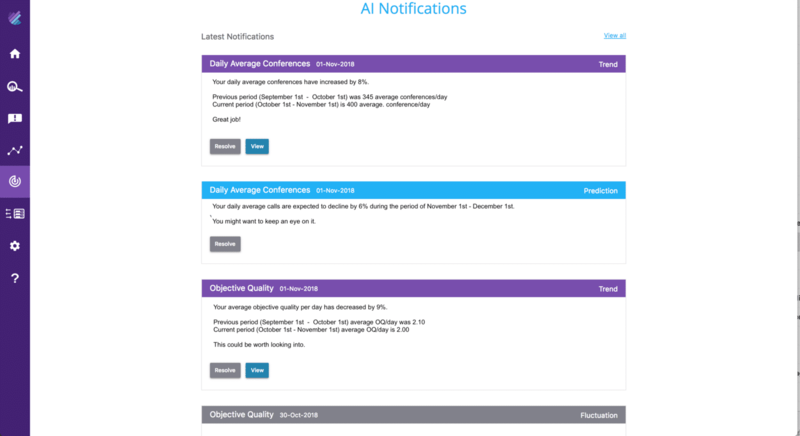 In addition, round-trip time and call count are automatically monitored by this first release of AI-powered analytics (read our white paper to learn about additional metrics on the roadmap). Four years of experience has shown us these KPIs help operations teams and product managers keep an eye on the overall health of their service. Using highly scalable statistical inference methods, we analyze data patterns and automatically set thresholds. This eliminates complex and error-prone manual processes that can produce false positives or trouble indicators that are altogether missed. All of these pieces come together to form an efficient, dynamic monitoring system backed by historical data analysis. The algorithms use historical data collected over multiple time windows to determine when a change is occurring. In a WebRTC service, problems are frequently unanticipated and may go undetected while users either abandon your service or suffer through a poor experience. Most monitoring systems focus on service-level KPIs that don't indicate when localized problems occur. Avoiding trouble requires predictive capabilities that aren't available in contemporary monitoring systems. We’ve applied machine learning algorithms to alert you to trouble before you start to lose customers. We automatically detect trends and fluctuations in KPIs – including normally fluctuating metrics, such as usage. Our algorithms include time series predictors that help forecast trouble so you can avoid it. With this combination of predictors and detectors, you can feel confident detecting and resolving issues before they affect user experiences. Trends and fluctuations are reported in a new window on the callstats.io dashboard. The system indicates the metric for which a deviation or trend has been detected, the magnitude of the change and the time period over which it was detected. The system monitors metrics over multiple time windows to detect changes in network operating profile that can occur in minutes or slowly unfold over months. Develop a hypothesis for the root cause, which requires expensive and hard-to-find communications expertise. Comb through mountains of data to find correlations and evidence to support a hypothesis, which currently takes way too much time. With our artificial intelligence roadmap, we look to rewrite the troubleshooting handbook by delivering a root cause diagnosis and eliminating hours of troubleshooting time. Artificial intelligence will develop a holistic view of network operations, identifying correlations across WebRTC application metrics and external factors. Using artificial intelligence, we will provide a reason for detected network behaviors that gives your team a comprehensive explanation for a problem and how to fix it, eliminating the need for expert analysis. By combining statistical inference, machine learning, and AI algorithms, we help save the time of your most skilled staff members. Their hours of monitoring and interpreting just became a single, easily understood notification. In our free white paper, Instantaneous Answers: How callstats.io Uses AI to Improve Communications, we describe our architecture and roadmap in detail. This is an exciting time to be a callstats.io customer. Our new AI-powered analytics is a cornerstone in our mission to deliver customers analytics with answers. We help accelerate the entire troubleshooting process, from detection to root cause identification, which delivers better user experiences. For more information, visit our page here. How to enable the new Amazon Connect based UI?